So, what’s new? Nothing much new here I admit, although the site is still in suspended animation rather than retirement. If only there were another 50% more hours in the day, then I could run two sites instead of just one. But for now, all here is not forgotten and there is still much to do. Let’s take a look at what happened during May. Blogher – are getting on my nerves now. Not only will they be taking 60% of my advertising revenue from 1st July, but I got a near incomprehensible message from them about an Ad Visibility percentage. Apparently my adverts aren’t being seen for long enough. People are scrolling down and the adverts become invisible. Well, whose fault is that then? Blogher have a rule that their adverts have to be above the fold, the only adverts above the fold and be the most prominent on the site. Great – I did that. Except of course readers scroll down to read the content, and the two Blogher adverts which are at the top of the site, are then scrolled away and can no longer be seen. So Blogher tell me that my advert spaces will no longer qualify for their premium advertising rates. So yet another drop in revenues from them. That is the third time in as many months. It seems they are looking for every possible excuse to pay out less and less to their members. Have you had this email – what do YOU think? Search engine traffic – something that isn’t getting on my nerves any more is Google. At last they saw the light and the error of their ways in May and restored to me my rightful search engine traffic at last, as part of the Panda 4.0 update. So I’m glad I put off spending all those thousands on SEO advice, because it all came right without me doing anything. Take a look! 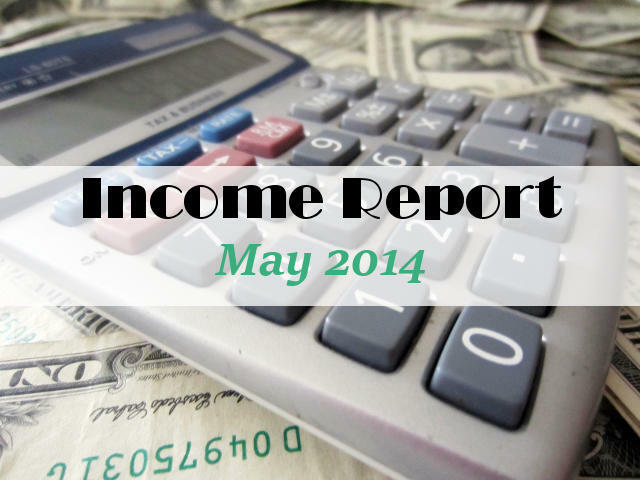 Do you ever read the monthly income report over at Matthew Woodward’s site? He made a very good point about trying to appoint an SEO expert – and I totally agree. It’s the very same point I continually try to make to my husband about investment advice. I tell him, if these people really knew what they were talking about and knew how to make a lot of money from investments, why would they be working a job and trying to earn a living my selling you their advice – they’d be lying on a tropical beach somewhere living off their investments. Matthew’s point on SEO experts was pretty much the same Anyone who is great at SEO is not out there selling their advice, they are out there applying those SEO principles to their own sites and making money online. Duh – I completely agree Matthew. So now my happy Google accident has put aside my SEO worries – until next time. Infolinks – I’ve had several email conversations back and forth with Infolinks in recent months. Has anyone else noticed a change in the adverts they’ve been serving recently? Or perhaps its just me. But I was finding that I was getting comments from visitors who were arriving via links on other sites to my patterns, to say they weren’t able to download the patterns. When they clicked the link they would go to a random page. Because all these new visitors to the site were unfamiliar with it, they were clicking on the Infolinks underlined words and following through to adverts and not the pages on my site or downloads they were expecting. The final straw came when one user reported that after clicking on one of these adverts, they were sent to a site that had a pop up telling them that their computer had been infected with a virus and they needed to download software to correct it. If you’ve browsed around enough, you know the sort of links and sort of sites that I mean. Spammy sites basically that try to scare you – there is no virus, every one visiting gets the same pop up and is treated with the same contempt. That was it. I didn’t want visitors to my site treated this way, or thinking that my site had somehow infected their computer. Infolinks, in text adverts are now gone from the sewing site. I’d rather protect the reputation of my site and ensure a good visitor experience, than earn a few extra dollars this way. I got a blogging job – I was accepted as the monthly sewing contributor at Little House Living. It’s a much bigger site than mine and I’ll be able to include a couple of back links to my own tutorials and projects so hopefully will get a few visitors from the site coming my way. There is also a small payment, which I’m going to hide under the ‘other’ section to protect the site privacy. It never hurts to get yourself and your style in front of a wider audience. Site hosting – I decided during the month that with all my new traffic I should really start to think about hosting. I took advice from other bloggers and went with Orange Geeks with my own VPS (virtual private server). Since making the move, I’ve been delighted with their service. They took care of the whole thing for me, without any downtime for the site at all, and everything has been running very smoothly. But of course it is a lot more expensive, so I’ll be showing $45 a month going forward for my new super-hosting charges. Adsense and DFP – do you use DFP? I can’t say I entirely understand it, but its where you can load all of your advertisers into the same space and then they compete against each other to display the advert for each page load. It’s supposed to get you the most possible per page load and therefore make sure every page counts, and thereby increase earnings over all. I had a company set it up for me, but rather than seeing more, I was seeing less revenue and eventually it became clear that it wasn’t working properly and the adverts were only being shown to around 25 % of page loads – the rest were blank. This went on for some time in May, so despite the increased page views, ad network revenue was down. I reverted everything back to normal at the beginning of June while we take a look at why its not working properly, and I’ll also apply to some new advertisers to use as well. More on that next month. Keep on doing much of the same. I’m running a readers survey over on the sewing site to see what people are interested in reading going forward. Have you ever done this? I think its a good idea seeing the site has expanded so much over the last year. I’ll be watching the survey comments with interest. That’s it, all I’ve got to share for this month. Hopefully I’ll be bringing you some more blogging tips and recommendations over the next 4 weeks. I didn’t get your email but I checked here anyway:). I started a blog and noticed my traffic went up once I used Facebook as a personal page. I just bring that up because I know you mentioned Facebook in the past. And yeah, you are right about SEO’S. Why does everyone just rehash everyone else’s material? The previous comment reminds me I must get my Facebook connected to my blog…I’m still enjoying blogging but life and family needs me at times so that comes first. Deby, congrats on your earnings and your new job. Regarding infolinks, same story here. People are complaining about them, that they can’t access the patterns, etc. I took off the in text option because it looks spammy to people and they are commenting this on other websites too. What a shame. Thanks for the info this month. I was getting that too – people who hadn’t seen them before were clicking everything and anything that was underlined trying to find the pattern download – even though it is in a big bright orange box that says ‘download here’. I am really focusing on building my deals site, trying to get away from my Blogspot site, but until I can get a page rank I think I am stuck with both. The hits are helping. Glad to hear your Google traffic is back where it should be. Unfortunately, I think the most recent Panda update hurt my traffic. I’ve noticed a big dip in search engine traffic since the May update. It used to be my #1 referrer and now it’s second to Pinterest with my Pinterest traffic being the same as it was before…but Google several hundred pageviews lower a day. And like you, I have more posts than ever and more back-links. Wondering if there’s any way for me to get back in Google’s good graces…. 🙁 Any wisdom you could send my way is welcomed. Thanks, Deby! I’m so sorry to hear that Laura – honestly, if I knew their secrets and how or why they had chosen one site over another to promote or demote – I’d be selling that secret for a lot of money! We all do all the right things we are told, yet sites fall in and out of favor. 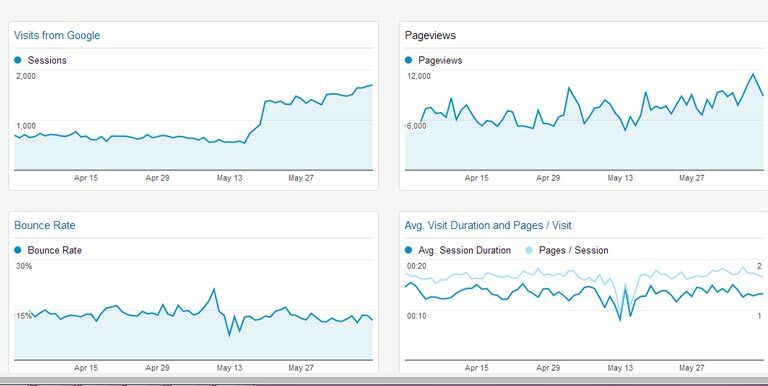 There was nothing different about my site one day than the day before, yet now I get twice as much search engine traffic – so its certainly nothing I did. Its ALL down to Google and their secret formula. So frustrating when all that traffic got taken away from me, but hang in there, and keep up all your good work, and hopefully the next update will restore you, like it did for me. Hi, Deby. I’ve been thinking about getting a VA to handle my adverts and such, since I can’t seem to find the time to fool with it. I’m making no money with my ads, and I know it’s because I don’t know what I’m doing in that area. The little I have done is strictly based on the information you’ve given, like Share-a-Sale. My blog gets about 12,000 unique visits per month and about 24,000 page views. Wouldn’t you say I should be making a dime at least? I’d love to know how you went about finding a reputable VA. Your sewing site seems to be your main focus, but I truly hope you’re not thinking of shutting down this blog. You’ve been a huge help to me and many others! Thank you! Wow, those numbers are very impressive. Well done! I’m curious to read more about your approach to Shareasale. Do you have any posts about your strategy there? I do know a few people who have used Shareasale as a secondary, smaller income source but I think you’re the first I’ve seen who is generating a bulk of their income from it so I’m very interested to read more about your strategy. No real strategy – I just have found a merchant in that network that my readers really like and buy from often. However things are about the change, they have announced a huge change to their plan and I expect to lose about 96% of my income from that merchant as a result. Really, its just down to finding the right merchant and products for your readers and review and recommend them often – genuinely.